Looks like only the English version is a registered trademark®. I guess the others can be stolen without penalty. On the other hand, I suspect they make no sense. 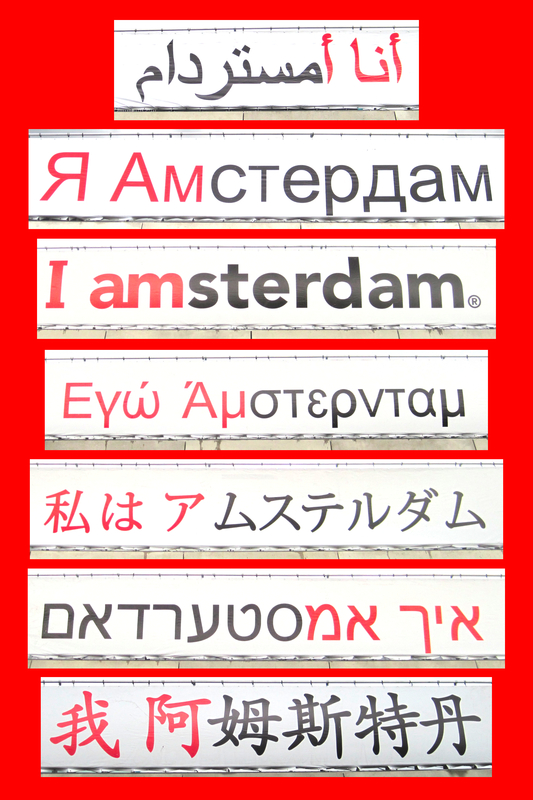 It begs the question though, doesn’t it: what precisely is amsterdamming? Creating artificial lakes with walls of small rodents? Travelling to another country to get wasted? Slowly, slowly sinking below sea level? I am sterdamming, you are sterdamming, she is sterdamming… Possibly it’s the state of being angry at a mixing bowl’s malfunction. Well, it is said that “hell is full of mice”. Conceivably there are also rats, gerbils, and ‘amsters damned. In purgatory they use multitouch, and in heaven there’s direct telepathic control. Trackpads? Limbo. But y’all have the grammar wrong. Sterdam is like Spartacus: a proper noun. And I am Sterdam. In Indonesian, fried chicken is known as Ayam Goreng. Has anyone a recipe for Ayam Sterdam (presumably translated as cosmopolitan chicken)? @8: I don’t know, but I assume at some point the chicken gets totally baked. So very very late to this party but the Arabic one should have the letter mīm in red as well, (that’s the one adjacent to the red vertical line with the squiggle at the top, it looks like a little circle or the head of a snake). BTW, in case you see this Abi, How do I get in touch with you via email, I have a book binding question for you (concerning a beloved Arabic dictionary of mine, a former constant companion of mine, bound in Morocco by the former bookbinder to the late King Hassan II, and whose cover has fallen off some time ago and it pains me so to see it in such a state). PS- love the B5 blogging having watched the entire run of the series for the first time about two years ago and I must remember to come back to it here and reread through your posts when I watch it again.